TV or no TV for babies? 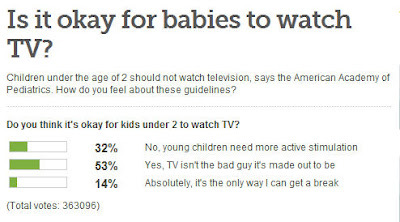 Do you let your baby watch tv? I do. I do not use it as a baby sitter but like most things in life one extreme or the other is always bad. I like a happy medium. Anna watches tv if I have to get in the shower and Blake has to leave for work early or if I am making dinner and Blake is taking out the trash or doing other things. However, she is not sat in front of the television. I put her in her jumperoo or pack and play with her books and doll. The tv is just on. And, honestly it's just background noise to her. She hits her music button on her jumperoo or chews on her doll's arm and pays no mind to what is playing on the tube. She'll occassionally glance when Moose A. Moose makes an appearance to sing the ABC's or something. Is this bad? Am I ruining her life? (sarcasm...) I have four nieces ages 14 (omg) to 2 years. They all did pretty much the same thing; tv was on but they played and did things and ran in and out of the house playing. They were never obsessed with the tv and are not overweight, not one of them has ADD or is on meds, and they are all on the honor roll, well except for Brinley who is only 2 and isn't in school yet. I find it funny that some people freak out and don't allow it at all until the age of two. What difference does that make if you wait until 2 or whatever recommended age?? If you wait that long they aren't going to know what to do and become obsessed with it. "Why would I play with these boring toys when I have this new moving bright colorful machine thing?" I don't know...that's probably extreme too. I do know one thing and I don't want Anna to sit around all day watching tv. When we first put Anna in daycare, not the fabulous one she is in now, there was a tv there and everytime I picked her up the older kids were sitting in front of it. It was on all day I am sure. that was one thing that bothered me and one of the reasons why we left. I have a tv but it isn't on constantly and I don't want Anna to sit around all day while I am paying someone to play and interact and teach her things. So, I do draw the line somewhere. :) Like I said, one extreme or the other is always bad. 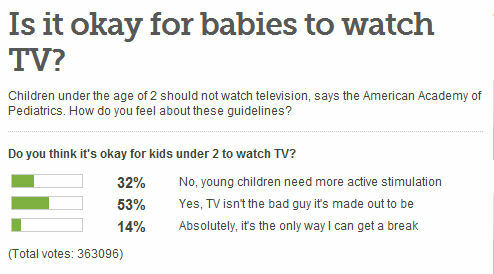 Here's a poll that was on my Baby Center email today that got me thinking of this topic. 53% of those who voted (I didn't vote; just viewed the results without casting my vote) said that "Yes, TV isn't the bad guy it's made out to be." What a wonderful first mother's day! Last year I knew I was pregnant and loved spending time with our baby then but of course now that she's here nothing can beat it! She has brought so much joy and laughter and smiles to everyone in her little life. She is a super easy and happy baby. She loves to laugh but something has to be really funny. :) She loves to be scared. She jerks and her eyes get big and then she lets out a deeeeeep belly laugh and gives you a look like, "Do that again!" She just melts my heart every time she grins. You walk into the room and she looks at you and gets a huge smile on her face! I love it. So, for Mother's Day we actually went to my parents Sunday morning for breakfast and that's where Anna was. She had spent the night so we could go to a wedding on Saturday. We woke up at 8 and my dad had breakfast ready for us and when we walked in she was sitting in the high chair watching Pop cook and she was banging her measuring spoons against the tray. She grinned so big when she saw us. It was a wonderful, wonderful way to start the day. After breakfast we got her dressed in her Sunday best and went and tried a new church. She did really well in Sunday School and the nursery workers loved her. One lady was holding her when we got there and she was shaking her hands and smiling at the babies rolling around on the floor. We came home and got her fed and she got a good nap and then we went to Blake's grandmother's house where his mom and aunts were for lunch. She entertained everyone for a good hour at least. She showed them her crawling skills and rolling skills and of course she got "harrassed" by her PawPaw Wiley. :) He loves to "annoy" babies but can never get the best of Anna. She just grins really big at him and laughs. Her Grandma got on the floor and played with her and she was held by everyone. I am not sure just yet but I think she might have Blake's personality. It takes her a while to warm up but after a few minutes she opens up and plays and talks to everyone. She's so loved by everyone in her life and we are very blessed to have all of her grandparents, aunts and uncles and cousins to share her life with. When we came home Blake fed her while I cleaned up a bit and she had fallen asleep so i quickly grabbed her up and took her into our bed for a nap. I thought it would be a short little cat nap like her typical naps but three hours later I was awoken by her tiny hands "hitting" my arms and face. She was ready to go and didn't go to bed until 9. Well, last Tuesday Anna had her eye procedure I was dreading. It wasn't as bad as I thought, which is great but it was still hard because boy could we hear her in the waiting room. Broke my heart. I was talking to my mom and heard a wail and I looked at her and said, "that's her." And, the tears started to roll. My mom squeezed my hand and we didn't hear anything else for a few seconds and then full on screams. Eeek. The nurse at the front desk must've run back there and she came back and said, "She's done! They're getting her ready to come to you." It was super fast thank goodness. They took her from me at 1:36 and we were getting in the car to leave by 1:44. That was after talking to the doctor about her eye drops and how everything went. He said he could feel the resistance in each duct that was blocking it but said he could feel it clear away. She fell asleep on the way home and we got home, got her changed and fed and she played the rest of the day like nothing happened. So, I was a very happy mommy knowing she was good. Her eyes were still goopy that day but I thought that was about normal. The next morning I was so excited to jump out of bed and inspect her eyes; hoping there wouldn't be any goop. But, there was. Again, I was disapointed but I figured it was expected since there was so much goop in her tiny little ducts. By the third day she was perfect. When her eyes watered it was super clear and just wiped away. We are still doing the drops, through Wednesday so that is the next test in my mind because we've used the drops before and it somewhat cleared it up but once we stopped it came right back. So, we will say and I've been praying non-stop that this worked. She looks like a different baby to us. We haven't had to wipe her eyes constantly and there's no thick yellow goop in the corner of them constantly. So, she's doing well and I would do it again tomorrow if she continues to not have any more eye problems!